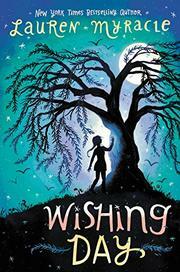 In sleepy Willow Hill, a girl’s many wishes come true. That’s what people say about wishes made on the third night of the third month after her 13th birthday. Seventh-grader Natasha Blok isn’t quite sure she believes this, but after her magical wishing night she does make her first kiss happen. Will the other two come true as well? The oldest of three motherless girls fewer than three years apart in age, Natasha is the responsible one, but she has a secret side: she writes stories. She longs for someone to see all of her, to be “somebody’s favorite.” When she starts getting mysterious messages, she thinks maybe that wish is coming true—or maybe it’s her “impossible wish”: that her mother were still alive. Grounded firmly in present-day middle school life, this has just enough magic to be unsettling and keep readers engaged. Natasha and her sisters, pretty Darya and creative Ava, are clearly drawn, believable characters; all are white. Her encounters with the elderly, enigmatic Bird Lady are deliciously puzzling. The chronologically straightforward third-person narrative is organized into sections separated by other characters’ revealing wishes and propelled by convincing dialogue.